Although Robert Downey Jr. said earlier this year he was hoping to begin filming Sherlock Holmes 3 in 2016, it looks like that won’t happen until after he finishes shooting Avengers: Infinity War. 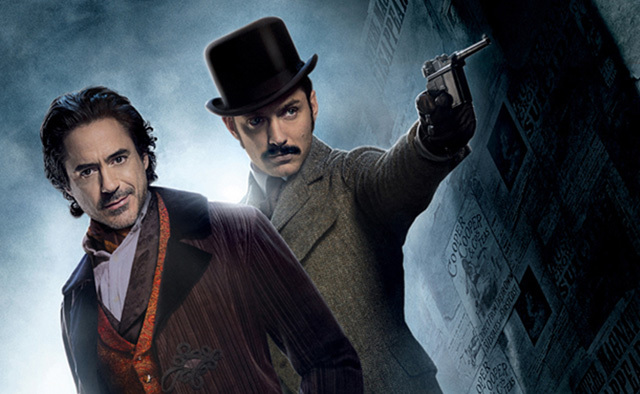 In the meantime, Variety brings word that Warner Bros. Pictures, Village Roadshow and Team Downey are forming a writer’s room to crack the Sherlock Holmes 3 story. The current team consists of Geneva Dworet-Robertson (Tomb Raider), Kieran Fitzgerald (Snowden), Justin Malen (Baywatch), Nicole Perlman (Guardians of the Galaxy) and Gary Whitta (Star Wars: Rogue One). Downey will reprise the Holmes role opposite Jude Law’s John Watson. Guy Ritchie, who helmed both the 2009 original and the 2011 sequel, Sherlock Holmes: A Game of Shadows, is expected to again direct with Susan Downey, Dan Lin, Joel Silver and Lionel Wigram producing. Although it will likely be some time before any of the Sherlock Holmes 3 supporting cast is confirmed, the franchise could easily welcome back some other familiar faces. Rachel McAdams played Irene Adler in both films, as did Kelly Reilly as Mary Watson. Game of Shadows also introduced Stephen Fry as Sherlock’s brother, Mycroft Holmes, and Jared Harris as Holmes’ arch nemesis, Professor Moriarty. Admittedly, more than one of those characters did not appear to have made it out of Game of Shadows alive, but that’s not necessarily going to stand in the way of them returning. Meanwhile, several alternate adaptations of Sir Arthur Conan Doyle’s iconic detective continue. The BBC is set to premiere the fourth season of Sherlock (starring Downey’s Infinity War costar Benedict Cumberbatch) on January 1, 2017 while the hit CBS series Elementary just started its fifth season. On the big screen, word recently broke that Will Ferrell and John C. Reilly are headlining the Sony Pictures comedy Holmes and Watson while the animated Gnomeo and Juliet sequel targets a January 12, 2018 release with the Doyle-inspired Sherlock Gnomes. What original stories would you like to see inspire the plot of Sherlock Holmes 3? Share your thoughts in the comments below!